What do we really know about refugees?Do we share experiences? What can theyteach us about ourselves by listening to their story? Athens 2018 World Book Capital, is a project of the Municipality of Athens which has the Stavros Niarchos Foundation as its great sponsor. Its aim is to make the act of reading books accessible to the whole population, as well as raising awareness of the projects that have materialized by the refugee population. Such projects are designed by refugees and eventually take form through their participation. The event “Listen to My Story” is scheduled for Wednesday, 20 June 2018, from 18:00 to 21:00 in the Serafio of the City of Athens, Piraeos & Petrou Ralli, Athens 118 55. Live narration, which pre-exists in all human cultures as a means of educating, entertaining and preserving memory, serves as an opportunityfor all guests to listen tolive storytelling by refugees, through the mediation of interpreters. 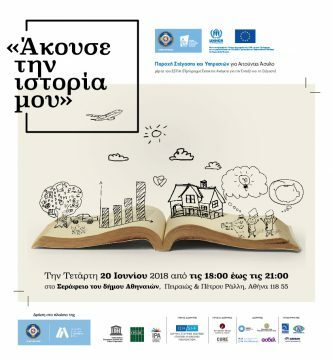 The event is supported by the Athens 2018 World Capital of the Book and is part of the Accomodation and Services Program for Asylum Seekers implemented by ADDMA of the Municipality of Athens with the collaboration of UNHCR, and funded by the European Union Civil Protection and Humanitarian Aid. Visitors choose the story they want to listen to, from a range of available “titles”. In these stories though, the narrative’s content is the refugee’s real biography. Live storytelling is an experience that overturns stereotypes and prejudices concerning the “other” and engages narrators and listeners into meaningful interactions. “When a man leaves his country, he takes it with him and tries to turn a foreign country, into a new homeland”, says one of our narrators. All narrators are housed in apartments in Athens as part of the City of Athens’ Housing and Services Program for Asylum Seekers, run by the Athens Development&Destination Management Agency. If you want to listen to a story about how a life was changed, please express your interest by visiting the following link https://www.eventbrite.co.uk/e/46837485179?aff=ehomecard#tickets . Participation for the event is free but places are limited and people who are interested will be assigned on a first-come-first-serve basis. The “Listen to My Story” event has taken place twice before: on Thursday, September 21, 2017 at the Melina Cultural Center and on Monday 4 December 2017 at the Panteion University. The great sponsor of the event is the Stavros NiarchosFoundation.Goldsponsors are the Latsis Foundation and Core Inc. Other sponsors are the Onassis Foundation, the Social and Cultural Work Foundation (KIKPE), the A.K. Laskaridis Foundation and the Association for the Collaborative Management of Speech Projects (OSDEL). Valuable supporters are Aegean Airlines, Athens International Airport and the Fixed Transportation (STASY) company.